You can purchase the Kids' Wings 11-page Kids' Wings Unit for The Perfect Nest by Catherine Friend NOW for immediate download for only $7.95! Have you ever been hungry for the perfect food? You know, the only one that will satisfy your hunger? The one that you will do most anything to get? Well, if you have, you will understand why Jack the Cat did what he did to get the perfect omelet. He figured that to make the perfect omelet, he first had to have a perfect egg. And, of course, to get the perfect egg, he first had to get a perfect chicken to lay it. How could he attract the perfect chicken? With The Perfect Nest of course! You will cackle with laughter ... and maybe throw in a good old fashioned honk or two...as you read this hilarious story of The Perfect Nest that turns out to be ... well, you'll see! The Kids Wings unit for The Perfect Nest by Catherine Friend will delight your kids and inspire them to build skills through their natural concentration in this award-winning literature. And best of all, it will motivate them to build a life-long love of reading. 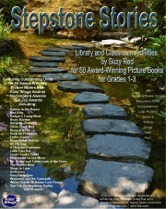 The Perfect Nest is one of the 49 Kids Wings Literature Guides in the Stepstone Stories Collection! On sale for $25!